Some of you probably know the story of how I happened to stumble across a blog called What I Learned Today a little over a year ago. You may even know how an offer from me of a weekly guest post developed into a working partnership between Billy Coffey and me. What you may not know, or fully understand, is why I offered to help Billy. In a nutshell, it’s because I have compassion for his passion: writing. If you haven’t already done so, I would recommend reading his post today: Compassion in the Cold. It give a glimpse into just how long he’s been pursuing this almost lifelong passion of his. It is a story of one of the many crossroads in his writing career. Our chance meeting through the blogosphere (if you want to call it that–I don’t believe it was) is another. Shortly after he started guest posting for me, he mentioned to me via email that he had a manuscript he was trying to get published. He had had several rejection letters from agents and publishers, many of them telling him the same thing: You need to build a platform. What I Learned Today was that platform. Again, many of you may already know this part of the story. Now here’s the part you may not know. By the time I offered the weekly guest spot on my blog, Billy Coffey was once again ready to give up his dreams of ever being published. Billy is a strong, determined person, but rejection and obscurity after years of trying can wear down even the best of us. Having read his manuscript, there was no way I was going to let that happen if I could help it. So help I did, and continue to do so. Because it was the right thing to do. Because a world without his stories would be a little bit darker and a little less hopeful. The latest bit of exciting news came last week. Billy sent me a link to FaithWords Fall/Winter catalog, which just so happens to have the cover art from Snow Day gracing its cover. Here’s the link:FaithWords Fall 2010/Winter 2011 catalog. If you scroll through the entire catalog, you will find on page nine a description of first time author Billy Coffey’s novel Snow Day nestled between football legend James Brown’s new book and New York Times best selling author Philip Yancey latest offering. I’d say those guys are in very good company! This is not a post about what I did to help out a struggling writer. Billy Coffey’s work is well deserving of all the attention it has received and will continue to receive. I write this because I want to challenge you. If you know someone who has a dream, and can’t seem to get over the hump by him or herself, offer to help them. If you believe in what they are doing, have compassion for their passion. You may just find, as I did, that helping others is a passion of your own. This post is part of the blog carnival on Compassion, hosted by Bridget Chumbley. To read more, please visit her site. I trying to remember where I first came across today’s guest blogger, Heather Sunseri. I want to say Twitter. Which, for those of you still stubbornly refusing to join, has been an incredible resource for finding some of the best writers on the internets. Just saying, Sharkbait. Regardless, Heather’s a great writer and a great person. I am a Christian, wife and mother of two young children. I have worked as a CPA for the past 15 years for thoroughbred horse farms and in public accounting in Central Kentucky. I spend my free time as an inspirational writer and enjoy the little things in life from long bike rides in the country to homemade pizza and family game night. I’m always pondering God’s purpose in my life. You know, the big plan. And do I have enough faith to know when I’m living it? As a young child, I was taught to smile through most anything. God won’t send you a memo with a bullet-point to-do list on how to live out His plan. You must put one foot in front of another, get your hands dirty, put a smile on your face and get to work. Of course, all that mixed with a heavy dose of faith that God will pick you up when you fall, and you’ll feel Christ’s love as you work. I find it’s easier to do good works–you know the “works, which God prepared in advance for us to do”–with purpose if you keep the faith. Easier said than done, right? I’ve also been a big believer that God’s big plan lies somewhere in the midst of the little jobs we do along the path of life. And I hope that’s what I teach my kids. The problem? I almost forgot recently. So, thanks, God, and thanks, Mom, for the little reminders to find joy in the little things in life. One day toward the end of spring break, my mother called to ask me if each of my children could have a baby chick as a souvenir from their spring break with my parents. “I’ll have to think about it.” That, of course, was my way of saying “no” to my mom, but I was too tired (cowardly) to actually say it and listen to all the reasons of why I’m unreasonable, unfair, etc. I hung up and did what anyone working in an office would do. I pled my case to the people in the neighboring cubicles. And of course, just as I suspected, they all sided with me. 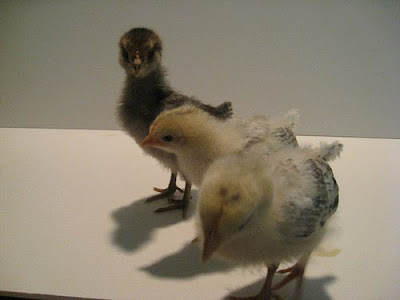 Alas, after two weeks with Prim, Comet, and Jenna, I admitted to my ten-year-old daughter that I was thoroughly impressed with how well she took care of the chicks. They had grown and thrived. She and my son had cleaned their makeshift cage twice daily, fed and watered them. They even took them outside on sunny days and played with them in the yard. My daughter’s a dreamer like me. But she’s right. It was her purpose at that moment. And she got me thinking. Wouldn’t it be nice if I tackled all of my jobs (toilet-cleaning, carpooling, volunteer work, my current career, writing) with the purpose and glad heart they deserved? Wouldn’t it be wonderful if we all did? We don’t get to see the blue print God has for our lives, and sometimes we’re faced with not-so-easy of times. But through faith and love of Christ, we put one foot in front of the other, dig in and get our hands dirty, put a smile on our face, and we just might get a small taste of the big plan. To read more from Heather Sunseri, visit her at Balance with Purpose and follow her on the twitter at @HeatherSunseri.